Gibbs Glade Villa is an immaculate, wonderfully tranquil, light and spacious, 4 bedroom, 4 bathroom detached villa, with vaulted ceilings throughout. Set in secluded, tropical gardens with its own pool and access controlled gates, situated in the safe and peaceful neighbourhood of Gibbs Glade. Daily housekeeping, with changes of linens, bath & beach towels, bathrobes, ACs, super-fast internet, cable TVs with Netflix plus access to the Mullins Beach Bar & Restaurant (now exclusive to Royal Westmoreland - a sublime spot for a sundowner and an early dinner), are all included in your rental fee (for 2019). Our guests may enjoy a 10% discount off bar & restaurant bills here where, sun loungers available for hire, plus our guests can get a generous discount off visitor green fees at the nearby, prestigious Royal Westmoreland Golf Club (restricted tee times apply). We are pleased to organise your airport transfers (at guests own expense* ) with our preferred service who tracks your flight and liaises with the villa and we would be glad to book your fast track airport arrival service, (at significantly discounted rates). We will gladly arrange to have your list of groceries delivered to the villa prior to your arrival and we are pleased to recommend our preferred services; including car hire car, a local catamaran cruise company and a highly regarded spa service, all at specially discounted rates to our guests. Subject to availability, we are also pleased to introduce you to an excellent chef services company for that extra bit of pampering or that special occasion (sample menus available). 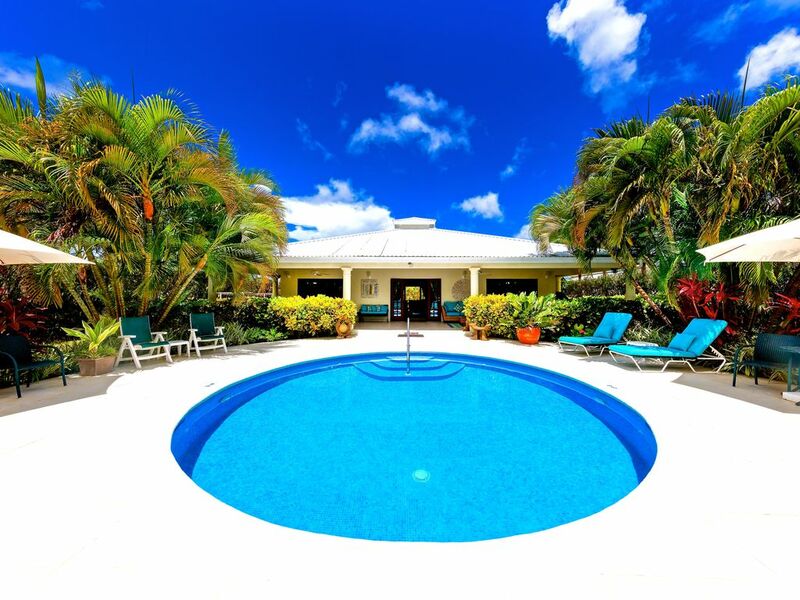 Ideally located on the 'platinum' west coast, between Speightstown and Holetown, with the idyllic, Gibbs Bay, with its crystal clear Caribbean waters tucked away, just a short (4 mins) stroll away. Whilst the livelier Mullins Beach with its private Beach Club, loungers for hire and water sports, is just a 5 minute walk via a short cut. The open plan layout of this single story property is ideal for multi-generational family holidays as well as couples getaways. There is air conditioning in each bedroom and ceiling fans in every room and on the rear verandah. There's a Bose bluetooth speaker and WiFi throughout the villa. The well-equipped kitchen has new appliances including a multifunction electric oven with ceramic hob, large refrigerator, dishwasher, microwave, coffee maker, blender, juicer, toaster and a washing machine, exclusively for guest use. There's a large multi-burner gas barbecue on the rear terrace and a 40" Hi-Def flat screen TV with cable package above the granite breakfast bar. The Studio near the pool houses a 55" curved ultra HD TV with full cable, Netflix and DVD player, comfy leather sofa, rowing machine, exercise bike, light weights and yoga mats. There's a basketball hoop on the fully enclosed front yard where there is parking for 4+ cars. The authentic Speightstown, full of Caribbean charm, is approx 5 mins by car with the more vibrant Holetown with the stylish Lime Grove housing designer shopping, chattel village and numerous restaurants just 10 mins drive away. A car is recommended, but by no means essential. Alternatively there is a bus stop less than 10 mins walk and taxis are readily available and are reasonably priced. The villa has a preferred local service. There are a couple of supermarkets within an easy drive (Massy in Holetown and Jordans in Speightstown)and a 24/7 petrol station within walking distance (500 meters) which has a wide selection of convenience items available. The local fish market 7 mins drive, plus numerous restaurants and bars, all located within a short drive GGV. Both Mullins and Bombas are within walking distance. The grounds are fully enclosed and the whole exterior of the property is frequently fumigated to keep mosquitoes at bay. There are electric mosquito zappers on the rear terrace, plus netting on all windows. Access controlled gate entry, together with all-night 360 degree security lighting provides that extra peace of mind. We do not enforce a set check-in/check-out time, but broadly speaking, its around 12:00 and 16:00. Late departures can usually be arranged. If they cannot for some reason, ordinarily you will have access to the garden suite and studio until 14:00. on the day of departure, but this can be verified in advance. You will want to commence your return to the airport at least 3 hours before your flight. Housekeeping and Gardening is usually 5 times per week, for approx. 4 hours. The pool is usually tended twice weekly. As the villa and grounds has lots of space, the presence of discrete GGV staff should never impinge upon our guests privacy. Our villa manager is on hand at all times for any queries you might have. Please note that in July 2018 the Government of Barbados introduced a room levy fee which applies to all visitors staying in paid accommodation (hotels, guest houses, apartments, villas). It equates to 2.5% of the nightly villa rate for the whole party. Whilst the tax applies to the guests and not the property, the government have made the property owner responsible for collection of the room levy. From 1st March 2019 this has been added to the cost of your booking. . If your booking was made before this date, I will confirm the exact amount payable by you, prior to your arrival. * Licensed taxi fees are regulated in Barbados and our service charges the standard fares from the airport which are; 1-2 persons $60 USD, 3 persons $75 USD, 4-6 persons $85 USD and 7-9 $115 USD. The journey from the airport takes approximately 50 minutes. Gibbs Glade Villa is beautifully designed to provide a wonderfully spacious and relaxed living area, with simple symmetry, both inside and out with a high degree of privacy. It is a calm and tranquil oasis, set in a peaceful neighbourhood, with a almost constant gentle breeze and is within easy walking of one of the islands best kept secrets, the idyllic Gibbs bay. Waffle robes provided for guest use (not available in child sizes, sorry!). Hand soap, shower gel, tissues, cotton pads and hairdryers are provided in each bathroom. We have a 15% GGV guest discount in place with a leading car rental company, a local catamaran sailing company who do a fabulous 5 hour lunch cruise (swimming with turtles is almost compulsory in Barbados!) plus, we have a 15% guest discount in place with a reputable local scuba diving company. Wonderful place with beautiful surroundings! It doesn't get much better than Gibbs Glade Villa; Maria and her team were awesome! The villa has everything you'll need and more, the only thing we didn't have was more time. We all enjoyed our stay and will definitely recommend to friends and family. Thank you for being such lovely guests Keela and for the wonderful review. Coming from one of such discernment, I know it to be high praise indeed! Thank you. We'd be delighted to see you return. Our second stay at Gibbs, so knew that we would have a great time. The villa is spotless with plenty of space for everyone. Lovely gardens and pool - and just a short walk to the beach and local restaurants bars. Owner, Maria couldn't be more helpful, quickly answering any questions. Even Better than expected. Complete Paradise. We were eight adults at Gibbs Glade Villa for ten days. The villa has the perfect spacious layout for a large group with open style concept. Guests are immediately drawn to the gorgeous breezy terrace and sink into a comfy couch with a happy sigh “Ahh. We’re here! “. Life revolves around the pool area which provides luxury lounging as well as many little nooks for shady reading. Four bedrooms each with their own en-suite is ideal and the little workout studio in the back garden is a bonus. The kitchen opens to the terrace and has everything you could wish for which makes cooking at home easy. There are some top notch seaside restaurants very nearby so our group opted to go out 50/50. Location is perfect - an easy short walk to the beach with Holetown and Speitstown to the left and right. The staff who work at keeping the GGV and gardens in impeccable order are hardworking and super friendly as well. The best thing about this house ( and you can keep the huge front and back doors wide open) is the constant warm breeze flowing through the wide open living room. We didn’t realize it at first, but the soft sound of the palms rustling in the background lulled us all into a blissful calmness. It simply doesn’t get better than this. We were planning our return before we flew home! Once again we had a great stay, the staff were very helpfully. We would highly recommend this villa. Thank you Paul. We look forward to seeing you and Pam again for your 5th/6th? annual return in 2020. You are most wise to book your preferred dates for the next year as soon as you return. Beautiful villa we couldn’t find any fault with and Barbados is paradise we will defiantly be back to Gibbs Glade with out question . Thank you Maria Tonya Natalie and Not forgetting Donald who was a very pleasant gentlemen doing the airport transfer. Our second visit to Gibbs Glade Villa; we were fortunate to get a 7-day booking. We enjoyed our stay immensely. Our only regret was that we had not reserved more time at the property. The facilities are bright, attractive and comfortable. The pool and the garden area are inviting and always well maintained. The bedrooms are spacious and comfortable. Our two grandchildren were happy to spend the major part of each day in the pool. Our meals were all eaten on the back verandah with a clear view of the pool and the garden areas. We were not bothered by mosquitos or other pests. At our request the staff had shopped for our initial grocery requirements so that we could get started on our holiday immediately on our arrival. The kitchen is bright and well equipped. The staff also arranged for us to have two delicious Barbados dinners prepared for us, giving the cooks in our family the night off. The layout of the villa is spacious so that family members had room to spread out. A separate, well-appointed garden cabin is available to give guests added peace and privacy. There is also a separate studio where guests can play games, read and watch TV. The staff at the villa was always cheerful and helpful. Our thanks to Tonia and Natalie for making our short stay so happy and memorable. Many thanks for the thoughtful review Robert. We are delighted to hear that GGV fitted your family's needs so well. We truly aim to provide all the home comforts for our valued guests and are fortunate enough to have some wonderful, caring, staff to round things off. We very much hope to see you for your 3rd visit soon, although early booking is essential!! The villa is on the West Coast with Gibbs Beach being the closest just a 4 minute walk. It is quiet and secluded. A similar short walk along the same coastline in the opposite direction is Mullins Beach which is more active with a bar/restaurant with boat hire, jetskis and inflatables for the children. GGV is within 10 minutes of several renowned golf courses including the Royal West Moreland and Sandy Lane. For shopping , try Speightstown which is 5 minutes away and retains the original charm of the Island. The luxurious Lime Grove shopping centre with its designer shops can be found in Holetown less10 minutes drive away. The capital , Bridgetown , is a 30 minute drive with cricket at the Oval, horse racing at the Garrison and Barbados Yacht Club. Polo can be found 20 mins away at Holders. The villa is close to many upscale restaurants as well as more traditional bars restaurants and 'rum shops' with authentic, tasty and cheap Bajan cuisine. Some (Mullins/Bombas)are within walking distance. Of course you can always pick up some freshly caught fish from one of the many local fish stalls (closest being 2 mins drive) which you can grill on the gas barbecue and enjoy al fresco in the tranquil ambience of the well lit pool, terrace and gardens. Perfect! Please note that in July 2018 the Government of Barbados introduced a room levy fee which applies to all visitors staying in paid accommodation (hotels, guest houses, apartments, villas). It equates to 2.5% of the nightly villa rate for the whole party. Whilst the tax applies to the guests and not the property, the government have made the property owner responsible for collection of the room levy. From 1st March 2019 this has been added to your nightly rate via this system. If it has not been included at the time of booking, I will confirm the exact amount payable by you, prior to your arrival. A full refund is available up to 60 days from arrival. In the event that your dates change after this period, and we are able to accommodate the change, we will gladly transfer the monies to your new dates.